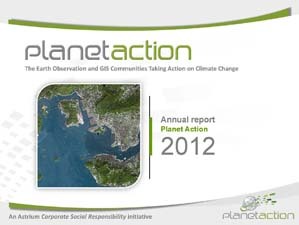 Planet Action is a non-profit initiative launched in June 2007 by Spot Image. It has been joined by ESRI as a co-founding partner very early, and other partners have also joined the initiative since. More recently, Planet Action and the UNESCO signed a cooperation agreement within the framework of the Open Initiative to support World Heritage sites. Man-made climate change is a global issue with serious threats: this is a new challenge for our societies and communities to get fully involved with new and cooperative approaches. It is our ambition, as a committed and responsible corporate citizen, to bring quality technologies and expertise to the non-profit community working on climate change. The projects benefiting from Planet Action grants reflect the complexity and interactions at stake in shaping a future based on sustainability. We are grateful to them for their work and feedback. We also appreciate the strong relationships that help us share knowledge within the Planet Action’s community: non-profits and NGOs, technology providers (ESRI, ITT, Trimble), experts, and outreach partners. We hope this Annual Report presents an accurate picture of our activity and our personality.